Use any combo of beets you like for this obsession-worthy vegan gluten free side dish or main course. If you don’t have a mandoline slicer, grate the beets and fennel instead. You won’t get the same visual effect, but it’ll still taste incredible. Preheat the oven to 375°F. Grease the bottom and sides of a 10- to 12-inch cast-iron or ovenproof skillet with oil. In a blender, blend the shallots, coconut milk, soaked cashews, vinegar, 1/2 teaspoon salt, and a few grindings of pepper until silky smooth. Fold in the chopped mint. Set aside. Using a mandoline, slice the golden beets into ultrathin round slices (the thickness of a dime) into a bowl. Into another bowl, slice the fennel bulb the same way and add a small handful of fennel fronds. Reserve a few fronds for garnish. Into a third bowl, slice the red beet the same way. To each bowl, add 1 tablespoon oil, 1 pinch of salt, and a grinding of pepper. Massage the oil into the slices until all are coated with oil and seasoning. Pour 1/4 cup of the coconut milk mixture into the bottom of the prepared skillet and swirl to coat. 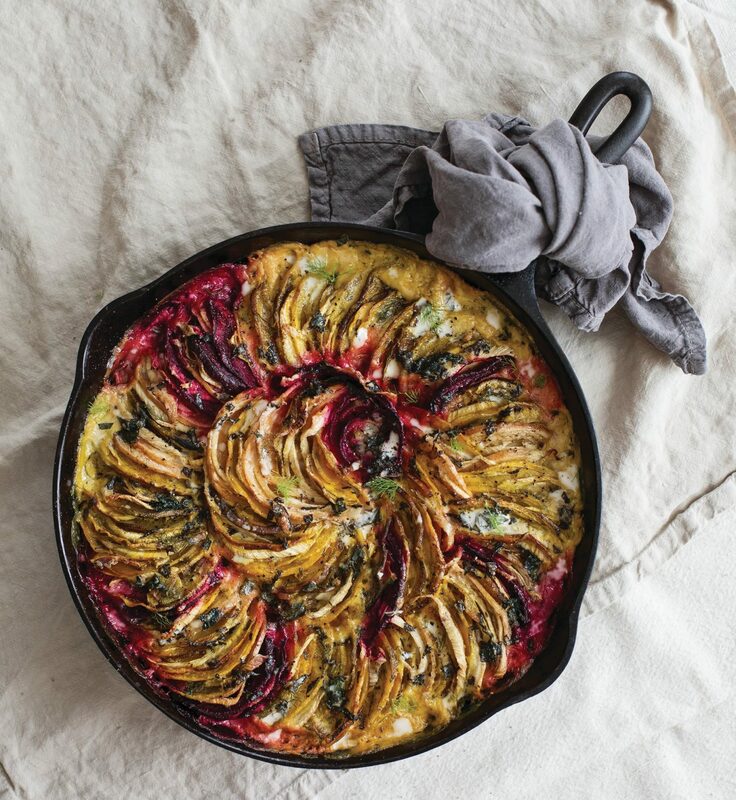 Fill the skillet with the beet slices in a tight, overlapping spiral pattern with a small handful of fennel strips tucked between each slice. Drizzle on the remaining coconut milk mixture and sprinkle with a pinch of salt and a grinding of pepper. Bake until the beets are softened, but not mushy, about 55 minutes. Taste a beet slice; if it’s too firm, cook 10 minutes longer. Let rest for 10 minutes. Garnish with fennel fronds, chopped mint, and a sprinkle of salt and serve warm.